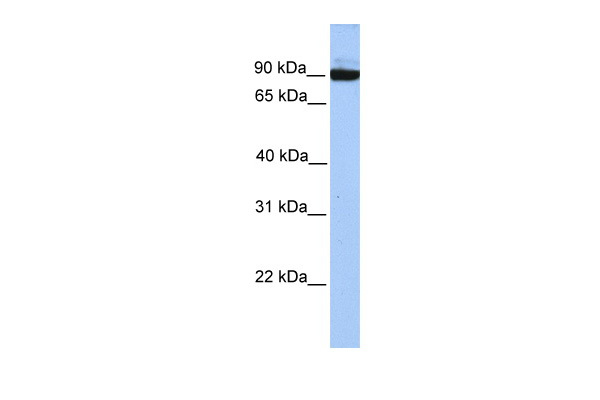 Western blot analysis of PCDH17 Antibody (C-term) (Cat. #AP53194PU-N) in 293 cell line lysates (35µg/lane). PCDH17 (arrow) was detected using the purified Pab. 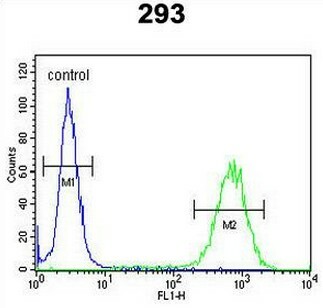 PCDH17 Antibody (C-term) (Cat. 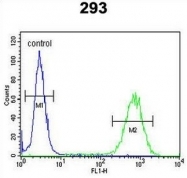 #AP53194PU-N) flow cytometric analysis of 293 cells (right histogram) compared to a negative control cell (left histogram).FITC-conjugated goat-anti-rabbit secondary antibodies were used for the analysis. (0.2ug/ml) staining of Mouse fetal Brain lysate (35ug protein in RIPA buffer). Primary incubation was 1 hour. Detected by chemiluminescence.